Hello - Sundip has contacted us and asked if he can keep everyone who reads the Legal Recruitment Blog updated with his progress, as well as get support and advice as required. I've just ended a conversation with Sundip, and asked him to keep the blog updated with his progress - we will post regular updates. Strongest growth of permanent placements since October 1997. Temporary/contract staff billings rose at sharpest rate for thirty-four months. Growth of vacancies eased but remained marked. Further rise in candidate availability. Wages and salaries increased again. This is one of the most positive reports on the recruitment industry for some time, although it has to be said that the strongest growth bit is a little bit of a red herring as the market has been stunted for so long it wouldnt be hard for it to expand rapidly! The number of permanent staff appointments made by UK recruitment consultancies increased again in March, with growth picking up to the strongest since October 1997. Higher placements were underpinned by a further expansion of permanent staff vacancies, albeit the slowest in three months. Growth of short-term staff appointments quickened to the strongest for thirty-four months in March. Billings were driven higher by the fastest increase in demand for temp staff since January 2008. Recruitment consultants signalled another improvement in the availability of staff during March. The supply of both permanent and temporary/contract candidates increased at slightly faster rates compared with one month previously. Salaries awarded to successful candidates placed in permanent positions rose again in March. The rate of inflation was solid, despite easing slightly from February’s twenty-month high. Hourly rates of pay for staff in temporary/contract employment increased at a pace that, although modest, was the sharpest since June 2008. Do you have a following without realising it? Do followings actually exist? Difficult question... Yes, on some planets followings do exist. On others, including Earth, 9 times out of 10 they do not exist. A 'following' is an interesting concept. For example, we often get called up by firms requesting a conveyancing solicitor with a following for a particular position. Think about it - how exactly does a conveyancing solicitor get a following? Most people tend to only move houses a maximum of once every five years, if that. Developers tend to go with a firm rather than a particular solicitor, and estate agents now want money to refer customers through to solicitors assuming they do not have their own call centre paralegal run conveyancing operation going on. Another one is for a family solicitor to have a following - again - most people tend to only get divorced once or twice in a lifetime, so how on earth does a family solicitor pick up a following? Commercial litigation, debt recovery, crime and company commercial solicitors can pick one up, but usually restrictive covenants potentially inhibit the solicitor's opportunity to take their clients from one firm to the next. If you do not think you have a following, have a careful think through who your clients are and whether any would come with you. To a certain extent you can ignore restrictive covenants. The easiest way of getting round them is to simply make sure you have spoken to all your clients before you leave to advise them that you are leaving, and to give them the name of your new firm in case they have any queries. You may be pleasantly surprised how many indicate that they want to follow you to the new practice. There is nothing to stop them doing this as far as I am aware - you have not touted for business, and neither have you done anything to encourage them to go with you. If you have a following, also consider why you are joining a new firm and not setting up on your own or pressing for partnership. After all, if you have sufficient fee generation from a number of clients, why not keep most of this yourself rather than give it to someone else? 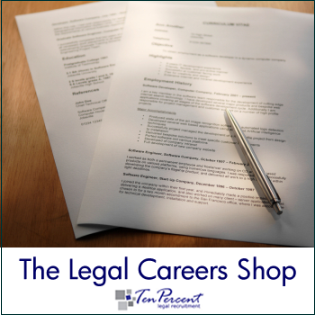 March 2010 has been a very good month for Ten-Percent Legal Recruitment and we are now not only optimistic of the market picking up, but also are aware that legal recruitment is back up and running at high speed. We have watched as vacancies are suddenly grinding to a halt in some areas, particularly for duty solicitors and family panel members, as there is a lack of fresh talent coming onto the market. In March we had 37 vacancies posted for a whole range of different areas including Conveyancing, Commercial Property, Wills & Probate, Crime (lots), Family (lots), Industrial Disease, Personal Injury, Agricultural Property, Housing, Child Care and Civil Litigation. Commercial still seems to be running at a fairly slow speed. We could go down the route of other agencies and post the generic mailing lists with commercial posts in that some of the bigger firms send out to 100 recruiters and hope for the best, but generally we try to avoid these as inevitably they result in no quality responses from our candidates. The market has turned, although there is still no sign of a major pick up in non-contentious work despite vacancies starting to materialise. The conveyancing and wills posts we have picked up have been for replacement partners or long term cover and tend to be from old clients who trust our skill & experience in assisting them rather than from new start ups or clients. The new tax year will almost inevitably kick start the next round of recruitment, and we expect to be very busy now for the next 12 weeks until July 2010 when everything will slow down again. The new Ten-Percent Unlimited Service has taken off in the last 4 weeks, and we are already assisting firms with expansion plans at very low cost to use our Candidate Database and recruit directly without agency involvement. Recent vacancies in - Duty Solicitor - Preston, Personal Injury Solicitor - Bradford, Family Solicitor - Twickenham, Crime Duty Solicitor/Caseworkers - West London (Ten-Percent Unlimited), Civil Litigation - Plymouth, Senior Conveyancing Solicitor - North London, PSL - Bristol, Business Development Manager (Conveyancing) - London, Agricultural Property - Southampton.